Deepen your sense of the past at sights like Sea Fortress Suomenlinna and The Esplanadi Park. You'll explore and learn at Seurasaari Island and Open-Air Museum and ARTag Gallery. 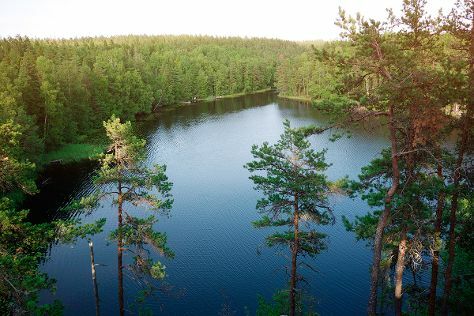 Explore Helsinki's surroundings by going to Espoo (Nuuksio National Park, Arctic Expedition, & more) and Sipoonkorven Kansallispuisto (in Vantaa). And it doesn't end there: pause for some serene contemplation at Rock Church, take a stroll through Katajanokka, browse the eclectic array of goods at Market Square Kauppatori, and stop by Artisaani. To find photos, ratings, more things to do, and more tourist information, you can read our Helsinki online driving holiday planner . Newark, USA to Helsinki is an approximately 17-hour flight. You'll lose 7 hours traveling from Newark to Helsinki due to the time zone difference. Traveling from Newark in June, expect Helsinki to be little chillier, temps between 65°F and 50°F. Wrap up your sightseeing on the 10th (Mon) early enough to travel to Loviisa. Loviisa is a municipality and town of inhabitants on the southern coast of Finland. You'll explore and learn at Nasin Kartanon Galleria and Porvoo Doll and Toy Museum. Your inner history buff will appreciate Cathedral of Porvoo and Castle Hill. Venture out of the city with trips to Porvoo (The Runeberg Home, Taidetehdas - Culture and Congress Center, & more). There's much more to do: look for gifts at Riimikko, steep yourself in history at Ungern and Rosen Fortresses, take in the spiritual surroundings of Orthodox Church Porvoo, and relax in the rural setting at Bosgard. To see photos, more things to do, reviews, and tourist information, you can read our Loviisa trip itinerary builder tool . Traveling by car from Helsinki to Loviisa takes 1.5 hours. In June, daily temperatures in Loviisa can reach 66°F, while at night they dip to 50°F. On the 14th (Fri), wrap the sightseeing up by early afternoon so you can travel back home.